Gallagher is now firmly in control, twisting and torquing Tozawa to the breaking point. But in an echo of earlier, Tozawa recovers thanks to his smash-mouth offense. He goes for a quick win with his top rope senton finisher. Gallagher spots the threat and rolls out to the floor. For Gallagher’s troubles, however, he receives that previously teased missile headbutt from through the ropes. Tozawa has little time to celebrate as Gulak and Kendrick rush the ring. Gulak takes a microphone and acknowledges that his team isn’t living up to their full potential. Gulak believes that it’s time for an old learning tool to return. Yes, that’s right, it’s the PowerPoint Presentation! We begin with slide number ten (for those of you new to 205 Live, this is a long story, but just go with it), Gulak has a “no mercy” slide, proclaiming that mercy is a weakness. From now on, this team will have no weakness; no weak links. 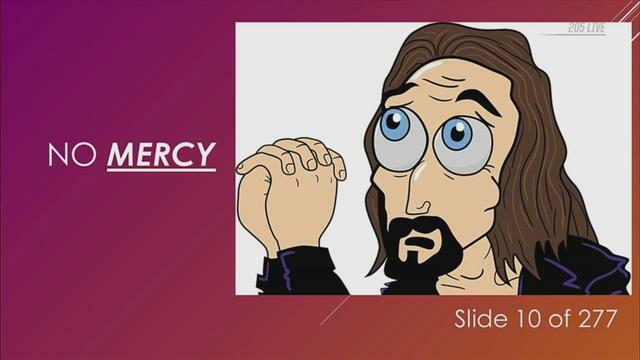 It should be said that the illustration on the slide is reminiscent of a merciful Brian Kendrick. 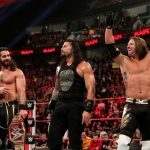 Gulak waste little time in addressing Kendrick, stating that the team will have no place for former Cruiserweight Champions who have lost their edge. Kendrick realizes that the vultures are circling, and pulls the first punch on Gulak. Unfortunately for Kendrick, Gallagher and Gulak outnumber their now former stablemate, ending with Gallagher peppering punches onto Kendrick whilst in the Gulock. This was quite the surprise. For the first time in his entire 205 Live career, I have genuine sympathy for Kendrick! Maverick is asked by Kayla Braxton backstage on the status of Hideo Itami and Mustafa Ali after their grueling encounter last week. Maverick has given both men the night off tonight and promises that the next time they square off, it will be a match that nobody can miss. The pair square off with a series of technical exchanges and lucha based offense, Kalisto with a hurricanrana style takedown to gain the upper hand. He mocks TJP with some “floss” dancing (is that the right term??) but manages to stay afloat of TJP’s anger by reversing anything thrown at him with more innovative dodges and offense. TJP can’t handle Kalisto’s attitude tonight, becoming angrier by the second. Kalisto shows off one too many times, however, a handstand escape resulting in a basement dropkick to the face by TJP. The inaugural Champion continues the assault with a pendulum dropkick on the apron, keeping momentum and pace on his side now. TJP is in his element. While grounding Kalisto in an Indian deathlock, he rips off the tail of Kalisto’s mask, throwing it out of the ring. Like a superhero, TJP has broken a part of Kalisto’s powers it seems, the luchador struggling to get back into the match. He tries for a springboard attack, but TJP follows and floors him with a modified Russian leg sweep off the middle rope. TJP focuses on Kalisto’s neck now but still takes time to mock the Lucha House Party with some poses. TJP keeps a suplex locked, transitioning into a back suplex, earning a near-fall. He gains another two count with a corkscrew Swanton of sorts from the second ropes. Kalisto tries for another fightback, but TJP shuts him down almost immediately. TJP climbs the ropes but wastes time with more showboating. His second Swanton bomb attempt is avoided by Kalisto, who is now able to deliver, in succession, all the offense he was unable to until now. TJP takes matters into his own hands. He starts ripping Kalisto’s mask off. Gran Metalik comes down to help his teammate, but TJP fights him off. This distraction allows Kalisto to roll up TJP for a surprise win. For more shocking turns of events, let’s all cross our fingers for a Buddy Murphy victory this Saturday! 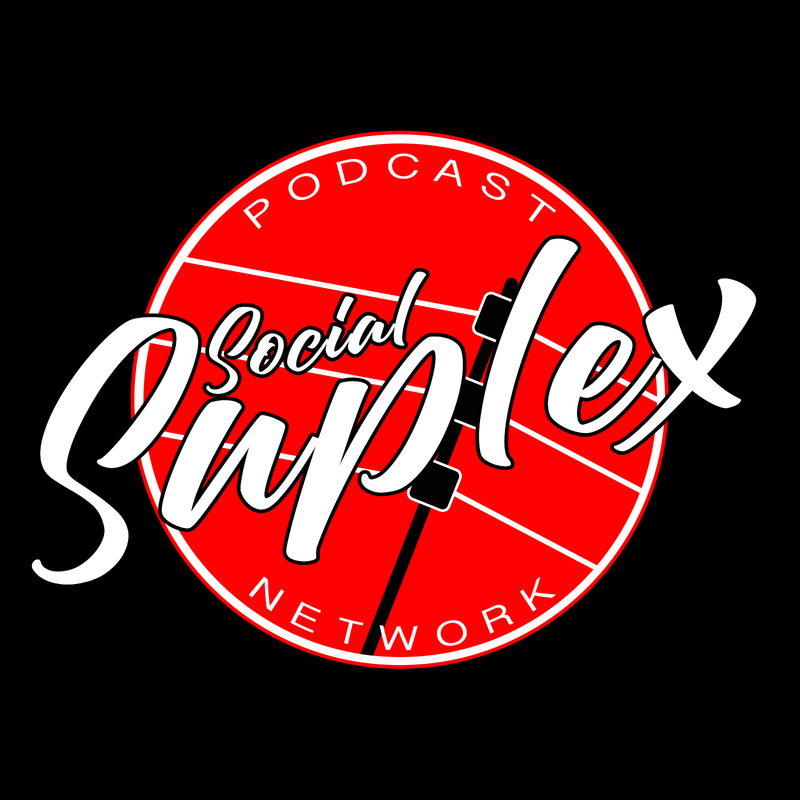 In the meantime, if you want to hear more WWE opinion from “Clive” out with the 205 Live bubble, check out my podcast, “The Ricky & Clive Wrestling Show”, on the Social Suplex Podcast Network. Clive runs it solo this week with Ricky being a late drop-out. Nevertheless, Clive soldiers on with your go-to preview of this Saturday’s WWE Super Show-Down in Australia. He looks at the card in its entirety (so far), how the build has been for this show, and what, if any, surprises we may get. A shorter episode than normal this week, but Clive covers all you need to know for the super duper house show. He even manages to solo quiz!